I don’t know why I feel guilty, but I do: I had never heard of Nikola Tesla until years after I graduated college. How can that be? How does one learn that Ben Franklin invented electricity, Marconi invented the radio, and Thomas Edison invented the electric lightbulb and apparently everything else? Not a word about anyone else’s contributions. Until one day, I asked someone to give me ideas for a gift and he wanted an out of print Tesla book. A what? Who? Not only have I read up a bit (not everything of course, and I don’t understand all that I HAVE read) on this fascinating, under-appreciated and important man, but I have also begun to appreciate Tesla’s scientific work for its artistic quality as well as his contributions to our life today and for the future. There is so much balance and excitement and energy (no pun intended) in the devices he created and used. So I have created several snowglobes with Tesla themes, often using the Tesla coil as a starting point to develop a tiny sculpture. 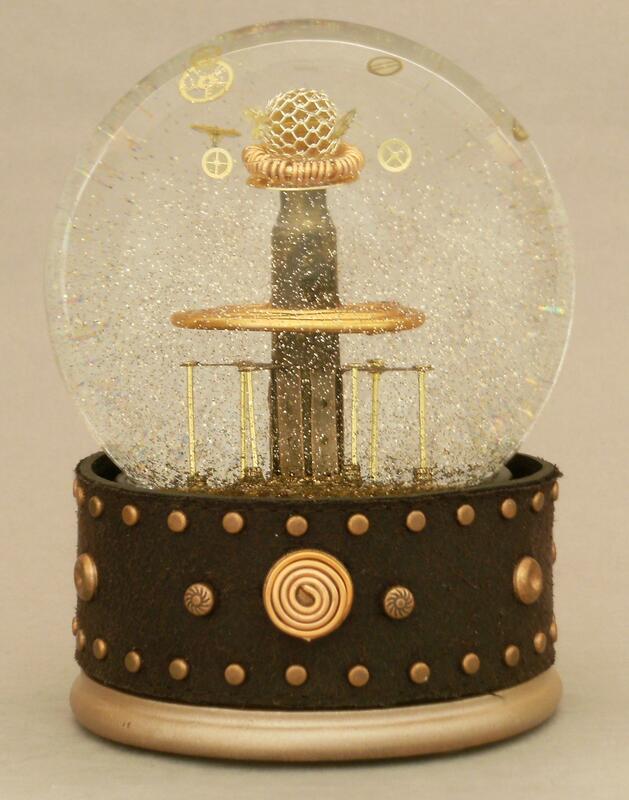 This is one of the waterglobes with a Tesla coil – liberties taken – enclosed inside. Recently, someone asked me what I was working on in my studio these days, and I said casually, “Oh, it’s a Tesla thing.” And my friend said “what? who?” and I realized it was my turn to tell someone else what we had missed in school. And so, this globe was named. If you’d like to comment, please use the box below. If you’d like to tell me that Ben Franklin didn’t invent electricity, that’s cool, too. That’s just so … cool! It’s been a crazy May and starting out to be a crazy/fun June. I am starting to see signs that July could be off the charts. Time to take a moment and thank a few folks for recent mentions in columns and blogs, or for otherwise assisting Camryn Forrest Designs in getting the snowglobe artwork out to be seen by people who might enjoy it. One definition of Circular Logic is restating your premise in a different way and thinking it’s the answer … and after a lot of trial and error, this is certainly true of this piece. It appears to go round and round, but always begins and ends in the same place it started. The conclusion is the same as the premise. 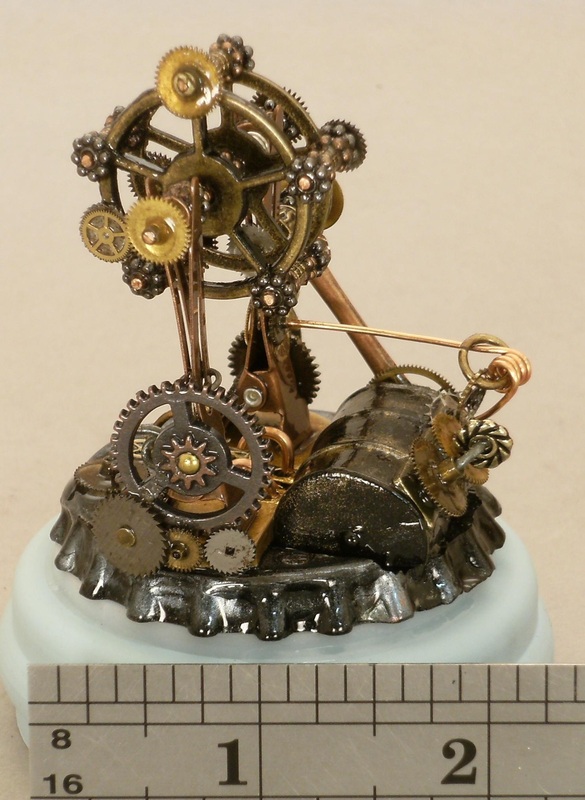 I got a little obsessed making this tiny curious invention, with all its layers of machinery. When I was working on it, I had to set an alarm to remind me to leave the workshop, stretch my legs, eat something. I even set an alarm to prompt when it was time to go to sleep. But I’d be in the middle of making some connection, or finding the perfect component, and I’d reset the alarm for another hour, then another. It was the opposite of the snooze button, wanting to stay awake and see the gears evolve, how the connections worked, spin the tiny wheel. As you can see from the photo, the finished sculpture was about two inches wide, and less than 3 inches tall when finished. The idea for this custom waterglobe / snow globe took that comment literally. There’s a tiny cash register, with steampunk detailing in the brass bands and tiny hardware, gear-tipped register handle, and tiny people sitting, standing and resting on the machine. But when you shake this globe, not only is there metallic glitter, but there are tiny dollar signs and tiny dollar bills swirling in the liquid when shaken. Because, you know, it’s fun to make a little money.